You can find parts 1 and 2 of this Idol Blogging Introduction series HERE and HERE! When it comes to the Idols that we love, there is no denying that we gather our information and insight into these wonderful performers through an abundant selection of Idol Blogs. Whether you read them for News, Picture Scans, Video Uploads, Ranking Posts, Reviews or more, there is always going to be something out there to cater to you, old or new! But wait! What about writing these Idol Blogs? Sure, it's fun and all to read them, but creating and writing your own posts is just amazing, too! Here, I hope to share with you all just why you should be an Idol Blogger, and how to help you with post ideas that you may want to write for yourself one day. So, if you're ready to get started, grab a pen and paper, or your own computer, and let's start writing our posts out and make them a reality! 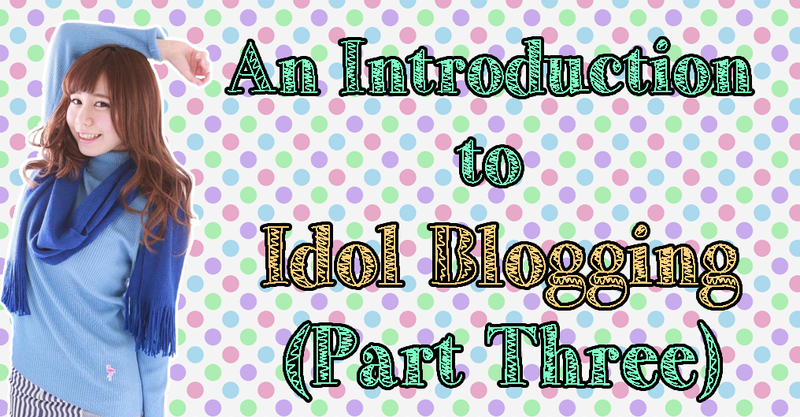 Throughout this small series of Blogging-themed posts, I hope to introduce you all to the key starting points of blogging, all in the hopes of inspiring future bloggers to the wonders of Idols and writing online. Written here is my very own experience in my five years of Idol Blogging, of which I want to pass on to others who have asked what it is like to be a Blogger, and what they can do to get noticed in this ever-expanding platform that is the online world. If I can help only just a little bit, then that is all I can ask for! Okay, so let's admit this from the get-go; creating content for your blog, no matter what it is, can become one of the hardest things for you to do once your blog is ready and rolling. What will you write about, what are the posts going to look like, and how will it all be structured? Heck, where does one even begin!? Questions, questions, questions! Luckily one thing you can do is Borrow; look at other sites, find inspiration from what they do, follow their structure and system, and of course, Adapt until it suits you and what you want from it. Take inspiration - Idol related inspiration or not - and let your ideas flow from there! Basically, you're going to borrow and adapt a lot from other blogs in order to find your own style, and given how much of a mixed bag the blogging world is, you can dip your hand right in and pull out something different and interesting each time. So, take your pick, play around a little, and see what sort of content works for you, and what you prefer to use primarily on your blog. Some sites stick to one thing and stay consistent throughout, whilst another blog will try and host more than one set post-type. Okay! Musume Time is a blog that was created to talk about the things I personally enjoy, whether they are singles, music videos, Idols or more. 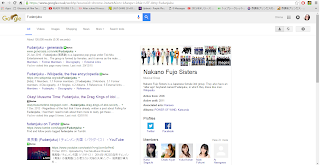 Over time it has adapted into something more, and has taken on News, Rankings, Gravure scan-based posts, Reviews and Group Introductions. There have also been posts dedicated to Podcasts, and there is potential for Interview based posts, too. Lots of blogs have different ways of producing content. As stated, some prefer to stick to one specific format and keep consistent throughout, whilst another will want to cater to a number of things. What you choose to do depends on what you want to write, and the content you would prefer to see within your blog. You are your Master, and the world online is your oyster. Honestly though, if you guys are anything like me when you first start on your blogging journey, then you may just walk into this blind and choose to figure it out for yourself along the way. Sure, you'll eventually find what you like along the way, but until then? Well, it's an adventure, and you're going to try whatever you can, whenever you can! So, have at it, and find what content you want to create, and enjoy writing some amazing posts! ... But first, there comes the dreaded First Post: one of the hardest posts you could ever write, if you ask me. This is it; the introduction. It's your leap into the world of blogging, and it's the post that basically states I Am Here!, and I am Ready!. Thing is, what do you do for an introduction post? Do you just say Hi, I'm so-and-so and be done, or do you write a Review? Also, what the heck do you even say in your opening post, other than your name (real or not) and a hello? Do you tell them what you imagine for your blog, or that you're shy? It's a never-ending pool of nerves, and honestly, you may wonder why you did that specific opening post one day (at least, I do. Seriously! ), however I will give the best advice I can give on this; consider more than one option, and write out a few posts if you are unsure. Or, if you are an impulsive soul and just can't wait to get your post out, then do a Chiima, and write when it comes to you and press Publish before your nerves can talk you out of it. It works for some, but it won't for others; it depends on what you prefer at the time. If you are a little stuck as to what to write though, I have compiled a list of options and topics to give you some ideas. These have been done by many others before and after me, and all are foolproof, I swear. So, take a look at these suggestions, adapt them as you will, and hopefully you will find a topic that you connect with to kick-start your writing and future posts. One of the more common ways to open up your blog. Introducing yourself allows you a gateway to not only allowing your reader to get to know you, but also to let them know your intentions for your blog. What do you want to do, what has inspired you to create such a spiffy blog, and what are your aims and goals? It's a great starting point if any. If you're not a big writer or you just don't like words all that much, then try something picture or video based and create a Top 10, 5, 3 or even a Top 100 list of your favourite things, whether they are Idols, anime shows, TV characters or the 11 best David Tennant moments in Movie and TV history. It can be whatever you like, a Top List of whatever, and it's a great way for readers to discover what you enjoy. It also opens up as to what future posts may be like or what they can include. Also, it's fun to devise these Top Whatever Lists! 30 Day Challenges are great because they help you to build up regular posts, as well as efficient in getting you into the blogging bug a little more. They're super easy to do, given that the questions are already laid out for you, and don't even require much writing if you don't feel like going into anything lengthy. It's also fun to take on the challenge as it gets you thinking about your own personal likes and dislikes, depending on the question given for the day. Reviews aren't always the first thing you see on a blog, however if you want to try it, go for it! I mean, it's what I did, after all. What's interesting about a Review post is that it will show off your writing style and interests to the readers, and it can be about pretty much anything from music to movies, food, leisure, books and more. If you want to write about it, then go on and review it! Picture posts are (generally) quick and easy to create; they require few to no words, and for many are greatly appreciated. If you have pictures you want to share, then post them for others to see and share your passion with the world! You don't even need to include that many images, either; one or two can be enough. By sharing your images, you are sharing with the world, and honestly, a lot of people will be grateful for it. And, once that all important First Post is done and dusted, you may find the desire to write even more thereafter, whether your posts are reviews, travel guides, interviews or news related. Or, you may not write more; Blogging is not for everyone, much like making videos or podcasts is not for everyone. If you do find a passion for blogging however, you do find that the more you do, the easier writing can become. Likewise, it can also become harder to create content, as you want to release near-perfect posts, or your ideas and desires change overtime and become a little more complex. Once your first post has been written and published for the world to see, your blog is well and truly alive. So, to those who have entered this stage of blogging, Congratulations! The thing is, when your blog is well and truly new, your view count will not be at the level you want it to be. Readership is, to put it simply, a slow process, and it's the same with podcasts and videos. Unless people are actively searching for your blog, there will be a few things you need to rely on to get your blog known. One of these things happens to be the use of Promotion. Social Networking sites have, as of late, become a rather popular form of promoting your own content; Facebook, Twitter, Pinterest, Tumblr and Google+ especially are used by many to get their blogs across the internet so that others can see what they produce. That said, whilst you can post on all sites listed here, be aware that a platform such as Pinterest has a strong focus on DIY, home and fashion based blogs, as opposed to general or niche interests. You can also easily link your friends and families to your blog posts through emails if you like, however it is easier to simply link through social platforms such as Facebook, Twitter, Tumblr and Google+, as all four are giant social media sites, and will help to boost your blogs views with any friends and family members who may see it. Also, thanks to the use of the share feature, as well as tagging, you can reach a decent number of people. Facebook's use of multiple online groups will help, too, and could reach more people than you will ever expect. As a side note; when it comes to the promotion and sharing of your very own blog, there may be a chance that you want to create a Facebook page or even an alternative profile and Twitter account dedicated to your blog. This can be for any reason, such as wanting to not bother those within your personal life with something they have no interest in, or just because you yourself happen to feel a little shy having others know you write a blog. Blogging is nothing to be ashamed about, and neither are your hobbies, however I have been on both sides of this fence; my family and friends within my personal life were annoyed by my love of Japanese music, so I created an alternative Facebook and filled it with people who shared my passion. With writing itself, I was at first shy to share my blog posts, however now I am more than happy to share what I do with others. It can take time, but sure enough, you will feel glad to share with others, especially if it is a piece you worked especially hard on! With that side note said and complete, if it's a bigger readership you would like, then do not simply rely on social platforms to get your blog out there; utilise the Labels or Tags tool that your blog has, and write in key words so that people around the world can find your blog. Tagging, retweeting, sharing and reposting can do a lot, but the way you phrase your keywords and label your post can help you even more, especially if you want to have your blog read by more people than those in your home country. Words like [Review], [Music Video], [Idols], [Blogging] and more can aid people in finding your post, especially if it's for a group that you and they love dearly. I have found that, by adding labels, some of my posts are found a lot more easily than others that don't have as many, or even any, labels added to them. 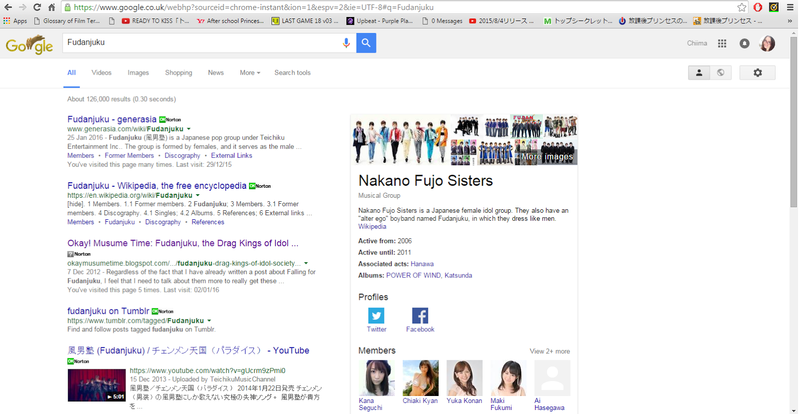 As an example, if you ever do choose to look up the group Fudanjuku online, my article on the group is actually the third post to choose from. I think it's because it has been read so many times, but it is because I have also used key words to define what my post is all about, and who it is about. Basically my highlight of being a blogger; I made the first page! In short; Label, tag and phrase your posts as bluntly as possible, for if you do, people will be able to find your posts a lot more easily - meaning that more people will find and read your blog if that is what they want to read about - and become potential new readers in the process! Promotion can take a while to get the hang of, but once you know where to post and what to tag, it will become pretty easy from there on! So get tagging, start writing, and promote what you love to do! Creating content and promoting your blog are never easy things when you are starting out, and yes, sometimes you feel like you are annoying others by tagging people or asking friends to read a post you enjoyed writing. The thing is, you will quickly come to find that there are people out there who love your writing, and yes, there will be those who want to be tagged in future posts you create because they want to see the content you have written. Little by little, your confidence in posting and promoting will grow, but if it isn't there from the get-go, don't worry! It will come to you naturally as you go along until you just don't care, and shamelessly plug what you do wherever you go! If you want your blog to be noticed, then yes, share the love, and share you piece with the world, even if it's just by linking your closest of friends and family! And with that all said and written, I want to thank everyone who has read this for taking their time to look through the third part of my Introduction to Blogging series. I hope that, in some way, I have helped you just a little bit and allowed you to take on a few tips for your own blogging and promotion experience. Until next time though, please take care, stay happy and healthy, love Idols, and enjoy writing! See you in Part 4!